UNITED NATIONS, October 11 -- In the current UN system, even when wrongdoing by high level officials is documented, there is little to no accountability, no matter the cost. The UN's ill-defined "UMOJA" program is now over-budget and two years behind, attributable to Paul van Essche, until recently its director. 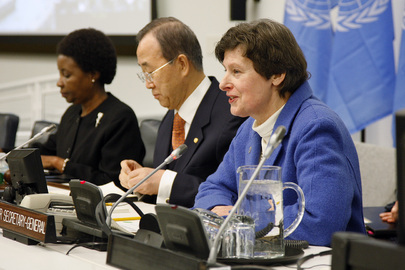 On Tuesday Inner City Press asked Angela Kane, currently the UN's top management official, if it was true that van Essche merely "declined not to seek renewal his contract," as the UN has described it, or rather was told to leave after irregularities were found even his resume or PHP, in UN parlance. Kane, who until recently was the Chair of the Steering Committee on Umoja, insisted twice that this was wrong, and said she never saw van Essche's PHP. Inner City Press asked her about, and now puts online, a review of van Essche's PHP, here. Where is the accountability? In other answers, Kane said the UN had no knowledge until it was published of the Memorandum of Understanding between the City, State and UN Development Corporation to construct an office building for UN use on what is now a playground on 41st Street. Inner City Press asked Kane for the UN response to neighborhood complaints that a playground and open space would be lost. Kane replied that her concern was to find office space for the UN, which otherwise would have to built on the UN's Lawn -- which it should be noted, neighborhood residents are not allowed to access or use. And so it goes at the UN. Footnote: Kane's budgetary answers referred repeatedly to currency exchange rates, for example for the Swiss franc. Also in the news Tuesday was Hungary's decision to allow its citizen's to repay mortgages to largely foreign banks at a low exchange rate, leading to legal challenges. Hungary is standing for election to the Security Council, opposed by Azerbaijan and Slovenia. Hungary's spunky approach might be interesting on the Council. But that's another story - watch this site.